You can feel the excitement in the air everywhere around you in Dubai as it prepares for the holy month of Ramadan starting on Monday (August 1). Vacationers are jetting back to rejoin their families. Supermarkets are fully stocked in expectation. Malls are decked with Ramadan goodies in distinct areas. Shopping carts are overflowing with supplies to feed the extended gatherings as well as the needy. Pretty soon partition panels and screens will enclose the few cafés and restaurants where non-Muslims can still eat and drink during the fasting hours. Ramadan this summer coincides with the date fruit season. Palms all over Dubai are shedding their yields. City workers are busy collecting the fruits along major arteries, ready for distribution. The blessed fruit of the Muslim Holy Month is displayed everywhere in great varieties and quantities. Ramadan is a month of blessing, prayer, fasting and charity for more than a billion Muslims around the world, or one-fifth of humanity. Muslims believe the first verses of the Holy Qur’an were revealed during this month. It is recounted that a caravan trader was wandering the desert near Mecca in 610 AD when a voice called to him from the night sky. It was the Angel Gabriel who told Mohammad he had been chosen to receive the word of Allah. In the days that followed, Prophet Mohammad (PBUH) spoke the verses that would be passed on as the Qur’an. Ramadan is the ninth month of the Islamic lunar calendar, 11-12 days shorter than the Gregorian calendar. Thus Ramadan moves forward each year and eventually covers all seasons. During this month, Muslims will abstain from food and drink from first light to sunset. In Dubai’s summer months, fasting is all the more difficult with the heat and long daylight hours (4.16 a.m. till 7.06 p.m. on the first day). Fasting, or sawm in Arabic, during Ramadan is one of the five pillars of Islam. The other four are shahada (declaration of belief in the oneness of God and acceptance of Mohammad as God’s prophet); salat (daily prayers); zakat (alms-giving); and hajj (pilgrimage to Mecca). The sugar content of ripe dates is about 80%; dates are high in fiber and a good source of potassium, protein, fat and mineral products including copper, sulfur, iron, magnesium and fluoric acid. One date satisfies the minimum requirements of a balanced and healthy diet. 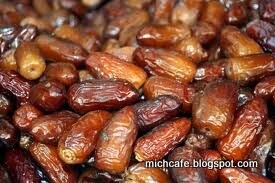 The date palm is mentioned not less than 22 times in the Qur’an, more than any other fruit-bearing plant. The evergreen consists of male and female trees. Only the female trees produce fruit, but one male tree can pollinate 40-50 female trees. Before the advent of Islam, date palms, particularly the highly valued male trees, were often cut down and destroyed in battles between tribes. However, this practice was strongly discouraged by the Prophet. There are more than 600 varieties of dates and among their many benefits are those to pregnant women. Many hadiths speak of the benefits of eating this “fruit of Paradise,” not only after fasting. "Ajwa dates are from Paradise"
Ajwa dates, from the Saudi holy city of Madina -- a soft, dry, black variety with very thin white lines -- were reportedly the Prophet’s favorite. He is quoted as saying “Ajwa dates are from Paradise” and they keep harm at bay. Because they come from Madina and were singled out by the Prophet, Ajwa dates are among the most expensive and a big favorite during Ramadan. The Prophet is also reported in the hadiths to have told his favorite wife Aisha that a household without dates is famished. 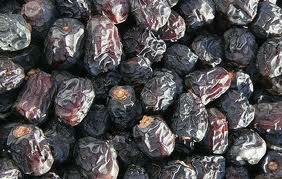 Dates have been cultivated since old times from Mesopotamia to prehistoric Egypt, possibly as early as 4000 BC. Date palm leaves are used for Palm Sunday in the Christian religion. Palm branches are also used during the Jewish Sukhot (or Feast of Tabernacles) service. The Food and Agriculture Organization (FAO) estimated about seven million tons of dates were produced worldwide in 2007. Egypt, Iran, Saudi Arabia, Dubai and its partners in the United Arab Emirates, and Pakistan were the top five date producing countries of the world. Between them, the five countries produced 67 percent of the world’s output of dates. This post was intended to take my readers around Dubai’s main supermarkets and date shops and show the beautiful displays and large varieties of dates on offer in the emirate during Ramadan. Unfortunately, wherever I went, I wasn’t allowed to take pictures. I was disheartened, electing to stick to nature and show dates on the palms around the city instead (more pictures here). Apart from the Ajwa variety, there is the Sokari, Khidri, Wanan, Madjool, Bahri, Segai, Maktoom, Deglet Noor, Khadrawi, Sellaj, Baraka, Kholas… These are sold plain or pitted and stuffed with caramelized pecan nuts, ginger, orange peel, or almonds. Balah are those picked before they are ripe and still bitter; the Rutab are frozen semi-ripe and kept in the freezer. So many products are made of dates. I saw a sparkling date drink, date syrup, date mustard, date Balsamic vinegar, date biscuits and date and walnut cake, to name a few. I finally got up close and peppy with one of Beirut’s most recognized landmarks – the Pigeon Rocks. It’s funny how you can live in a city for years and miss certain notable sights. I have seen the Pigeon Rocks flying into Beirut from the airplane window, from the Sporting Club beach where I used to and still go swimming, from going past by car. But I never stood right opposite them on the Beirut Corniche to value their size and natural splendor. To say the truth, my recent three-month stint in Beirut allowed me to go places that were almost out of bounds for me and nearly everyone else when I lived and worked in the city during the civil war. It was unthinkable for instance to stroll on the Corniche in the late Seventies, Eighties and early Nineties. Situated off the coast in the Raouche neighborhood of the Lebanese capital, the area overlooking the Pigeon Rocks reminds me of the Croisette in Cannes. It gives on the shimmering Mediterranean and is surrounded on both sides by a view of the mountains, their peaks covered by snow in winter. It is a favorite outing for ramblers, joggers and street cart vendors selling different produce in season. And Raouche is dotted with cafés and restaurants looking out on the Rocks. Raouche is on the Western-most tip of Lebanon. I presume it is a transliteration of “roche,” the French word for rock. It extends the Corniche that encircles the Beirut cape -- from the St. George bay to the north, all the way to Ouzai. I hadn’t planned to go to the Corniche on Sunday, but happened to be going past, and couldn’t resist a leisurely walk to get a closer look at the Pigeon Rocks. And what better way to enjoy the scenery than with a good cup of coffee and a bite? My cousin Lillian and I sat at the Bay Rock terrace to enjoy the view and the pleasant weather. (You can join us in pictures here.) The only sad sight is of the filthy water, covered by rubbish and foaming hugging the Rocks. Still, that didn’t stop small motorboats from circling and a few swimmers climbing all the way up to show off and win the appreciation of friends and passersby. There is always a sense of life and energy in Beirut, in whatever area you happen to be, and nowhere more so than on the Corniche’s seaside promenade. Sitting at Raouche, enjoying the mezze and Sunday lunch of rice and mutton, I continued to watch the vibrancy of Beirut, a city with a 5,000-year-old past. It so happened I was reading Amin Maalouf’s “The Crusades through Arab Eyes.” Berytus’ power and glory were destroyed by a triple catastrophe of earthquake, tidal wave and fire in 551 A.D. In 1110, Beirut fell to the Crusaders until 1291, when the Mamlukes conquered it. The Franj [as the Crusaders are referred to in the book] selected Beirut as their second target. Lying next to the Lebanese mountains, the city was ringed by pine forests, in particular in the suburbs of Mazrat al-‘Arab and Ra’s al-Nabah. There the invaders would find the wood they needed to construct the instruments of siege. Beirut had none of the splendor of Tripoli, and its modest villas could not easily be compared to the Roman palaces whose marble ruins were still scattered across the grounds of ancient Berytus. But because of its port, it was a relatively prosperous city, situated on the rocky slope where, according to tradition, St George had slain the dragon. Coveted by the Damascenes, held negligently by the Egyptians, Beirut finally had to confront the Franj on its own, beginning in February 1110. Its five thousand inhabitants fought with an ardor born of despair as they destroyed the siege towers one after another. “Never before or since did the Franj face such a harsh battle,” [chronicler of the time] Ibn al-Qalanisi exclaimed. The invaders were unforgiving. On 13 May, when the city was taken, they threw themselves into a blind massacre. To set an example. While reading my book and sipping coffee, I wondered what the Pigeon Rocks must have looked like at the time… When were they formed? Did they exist at the time of the Crusades and how big were they? More pictures of the Pigeon Rock outing here. Even before landing in Beirut a couple of weeks ago, my friend Sana Tawileh promised to take me to a place she was in no doubt I would love. As it turned out, she was right. We arranged to get together on Sunday when Sana led me down a little street in east Beirut’s Sodeco area. “We’re making our way to Al Falamanki,” she explained. Al Falamanki stems from “falamank” in Arabic, which specifically refers to antique diamond jewelry. Credit to Sana for introducing me to this unique café-restaurant sparkler. I was blown away from my first step in. Walking into Al Falamanki was like stepping inside either of my two grannies’ homes, whether in Beirut or Bethlehem. Everything looked familiar and cozy -- and that was even before I explored the garden area. This traditional Lebanese garden café-restaurant, sitting in a time-honored one-floor house in the middle of the bustling city, is a breath of fresh air. After many an “oh” and “wow,” Sana and I settled down in one of several comfy outdoor corners, where every chair, sofa and table is unique and distinctive in either style, fabric or upholstery. It was so soothing to sit outdoors, shaded by a parasol, surrounded by greenery and caressed by a gentle breeze that we stayed well into the afternoon. We enjoyed an exceptional lunch of hummus balila, fattoush salad, makanek sausages, grilled halloumi cheese with fig jam and other yummy house specialties. But this isn’t a food review. It’s rather a glance at a place I thought was so original and ingenious. Of course, I was itching to get out my little digital camera and start clicking, but the well-mannered waiters said I had to get permission first and gave me a number to call. I phoned in the following week. I was impressed by the speed and efficiency of the reply: I was welcome to return in my own time to take pictures and blog about Al Falamanki at Mich Café. So I headed back the next Sunday for a late morning coffee before customers started flocking in. Name branding (or the marketing practice of creating a distinguished presence on the market) led to the café-restaurant being named after Khalil Al Falamanki, a globetrotter from days of yore. His story, pictures and possessions are displayed all over the eatery. Khalil roamed the globe and met countless celebrities. There are “pictures” of him with Lebanese and international stars and politicians. His many tarabeesh (fezzes) are hung on one wall, his ouds (stringed musical instruments) on another. The furniture takes you back half a century at least, as do the cabinets with Khalil’s cameras, cigarette cases, lighters, watches and, of course, worry beads. Khalil Al Falamanki was born in Beirut in 1917. He took up wrestling in 1935 at age 18 to provide for his seven brothers and sisters. He met his good-looking bride-to-be Souad Karam in March 1940 and married her six months later. At the peak of his wrestling career, an injury forced Khalil into early retirement from the ring. Egyptian business tycoon Tarek Fakhry swiftly enlisted him as his PA and bodyguard. The association went from strength to strength, ending no fewer than 12 years later on Fakhry’s death in 1952. Khalil roamed the globe with Fakhry during the 12 years. In January 1946, they attended the opening of Flamingo Hotel and Casino in Las Vegas, Nevada. The following year, Fakhry took Khalil with him on a tour of Europe, where he introduced him to several worldwide celebrities. They frequently stopped over in Egypt to see King Farouk and often visited business partners in California where they would bump into the likes of Alfred Hitchcock, Frank Sinatra, John Wayne and Grace Kelly. 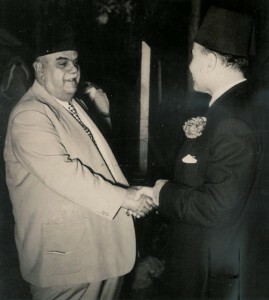 After Fakhry’s death in 1952, Khalil managed to maintain and even build on the contacts he developed over the past decade. The 1956 birth of son Anis was a source of pride and joy for Khalil. His two other joys were music and politics. Khalil passed away in 1982. Soon after, I discovered the many facets of the father I didn’t get to know well enough because of his travels. I started collecting the bits and pieces he left behind, such as his pictures with famous people, his hunting rifles, his backgammon tables, his many ouds and his inseparable tarabeesh. I decided to put them all under one roof in a place that would celebrate his love of food and music -- a place that would recognize and celebrate his rich life. This place is Al Falamanki. On shelves here and there are old radio sets, aged sewing machines, paraffin stoves, a typewriter, Khalil’s riding boots, the backgammon boards and other odds and ends. The floor indoors is made of colorful and assorted tiles. Even the men and women’s restrooms have special mirrors and lights. Each chandelier is a specimen. Outdoors, no detail is spared, down to the lights and birdcages hidden by tree leaves. Entertainment is card games or backgammon. The Sunday morning I was there clicking at my camera at an off-peak hour, a few couples were enjoying sheesha with breakfast and coffee. The voice of Fairouz and other old melodies blended with the chirping birds, Sunday morning church bells and the noon call to prayer from the nearby mosque. A pleasant Sunday feature at Al Falamanki: the volunteers from “Wishes Come True,” a children’s entertainment company. Celine and Rudy were there to keep kids entertained and busy with drawings, hand and face painting and games. My cousin Lillian and I were only there for Sunday morning coffee and I was a bit disappointed my Arabic coffee came in a small cup instead of an ibric, one of the many copper pots displayed on the shelves and designed specifically to make Arabic coffee. As we weren’t eating, I took pictures of dishes being served. Luckily we were invited for lunch, because the dishes all looked mouthwatering. After going around Al Falamanki one more time, to make sure I had photographed everything, we went out through the café-restaurant’s front arch, draped in a wisteria tree that I hadn’t seen since my days in London. But it wasn’t in bloom yet. I’ve only been to Al Falamanki during the day and maybe I should try it one night. But I’ll surely be back to enjoy the unique atmosphere, fine food and beautiful setting. You can see Al Falamanki for yourself in these pictures. For my Saturday walk around town last week, I thought of going to an area I haven’t been to in ages. When I was last living in Beirut during the 1975-1990 civil war, many areas were off-limits and inaccessible. It was a pleasure to explore them again over the past few months. It’s so easy to hop into a communal taxi and go almost anywhere in Beirut for just LL 2000 ($1.33). Better still is to take the bus, and the fare is just LL 1000 (66 cents). I used both that day. My cousin Lillian and I headed to Mazraa and then walked towards Basta, stopping at Barbir along the way. 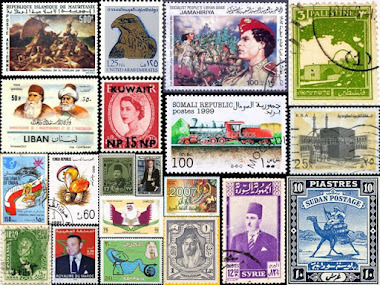 Both Mazraa and Basta are old Beirut neighborhoods with a rich and interweaved past. Basta was the stronghold of Beirut’s Sunnis at the turn of the 20th century. By the end of the French mandate, it became home to the Sunni bourgeoisie. Solh, Samadi, Kayssi, Baltaji, Akkari, Sardouk and Ariss were prominent Sunni families living there or thereabouts in the late 40s and early 50s. When I told a close friend who used to live in the area I was writing this post, it brought back many memories to him too and he recounted how Basta and Mazraa developed narratives of their homegrown qabadayat, or folk heroes, in tandem. The qabadayat were sort of Lebanese “Robin Hoods” for their times. They stood up for the rights and interests of their community, he told me, often taking from the rich and giving to the poor. They upheld morality and decency in community ranks and judged fairly in family or personal disputes. But their characteristics and deeds have at times been grossly overstated. My friend told me how he used to see Abu-Afif Kreidieh in Basta, mostly on Eid al-Fitr and Eid al-Adha. After Eid prayers, Kreidieh would stand with three of his men outside the Grand Mosque and hold a tablecloth to collect money for the poor. Abu-Afif Kreidieh was courted by successive Lebanese prime ministers (Riad Solh, Sami Solh, Abdallah Yafi and Saeb Salam) and was granted an audience with 1958-1964 president Fuad Chehab. I always like to give as much historical details as possible about the areas I visit. My sister Asma says I often sound like Google. In his view: “…There are for example the hakawatis, the storytellers, their craft being to use their great powers of imagination, their wide range of stories and legends, and their ability to improvise. People in their hundreds would surround the storyteller and listen to him while he enflamed their imagination, moved them deeply and even brought tears to their eyes. “First he might have read fortunes in the grains of coffee cups and in shells, entertained his village, enlivened its evenings, until he created a certain aura around himself, an individual personality and style, with a command of language, mimicry, movement, expression, voice and tonality, and a certain distinctive dress, the kumbaz, long robe fastened across the front and held by a broad cummerbund of silk or taffeta, often striped, round his middle, a fez on the head, a cane in the hand, and a distinctive way of walking and holding himself. Basta today is an antiques haven. It also boasts the last public Turkish bath in Beirut – namely, the century-old Hammam al-Nouz’ha (or “The Promenade Bath”) owned by the Bayrakdar family. I was disappointed to hear that Barbir Hospital -- bearing the surname of its founders -- that treated so many people and casualties during the civil war -- has closed down because of financial constraints. What I learned by walking down Barbir towards Mazraa and Basta and noticing an Ethiopian supermarket, was that the area hosts many Ahbash, who have their primary religious center in Basta. The Ahbash follow the teachings of Ethiopian Sheikh Abdallah al-Harari who brought his vision of political Islam to Lebanon in 1950 after fleeing the persecutions of Ethiopia’s late Emperor Haile Selassie. The first part of our walk in Barbir took us past the gold quarter, lined on both sides of the street with jewelers. It’s a fine place to go if you need to sell gold. But, dotted between them, were the occasional sweet vendor, and the rucksack corner display, whose owner was busier on his computer than selling his wares. We passed Mar Mikhail Church and then the delightfully renovated Majdalani house. Further down we got to Ahwet Doughan, a traditional street coffeehouse that my friends used to pass daily and where the neighborhood elders come for coffee, tea and sheesha. They also play cards or backgammon, chat, read the newspapers and discuss local and world events. They didn’t want to be photographed, but I could take snaps of the coffee shop itself -- a relic of times gone by. The architectural details of the ahweh are beautiful though, especially the little iron railings by the doors giving onto the street. A seller of ka’ak (a hollow, quasi-circular and crispy Lebanese sesame bread) passed by as my tummy was starting to growl. I could not resist a ka’aki, filled with Picon cheese and a sprinkle of dried sumac and thyme. This street vendor had a portable oven on his cart. It’s the first time I’ve had a hot ka’aki… Succulent! It reminded me of my friend Anissa Helou, who is a chef and author trying to bake ka’ak at home. Anissa writes on her blog that she and another friend, “Summer Blast” author Dania El-Kadi, were thinking how they’d love to munch some in London. So Anissa “decided to see if I could replicate them at home.” You can read about how Anissa’s tryout went. We continued walking down Mazraa, passing some very old buildings I hope will not be destroyed that contrasted with the newer ones. We passed shops that still practice dying trades, such as the mnajjed, a one-man upholsterer who beats then stuffs wool or cotton in cushions, mattresses, seats, sofas and who had a display of cottons at his doorstep. The closer you get to Basta, Beirut’s antiques market, the more the street is lined with antique vendors and shops. It’s a treasure trove. I remember we used to go there often when we moved to Beirut in the 1970s and had to furnish our flat on a tight budget. But it wasn’t a day for antiques hunting. 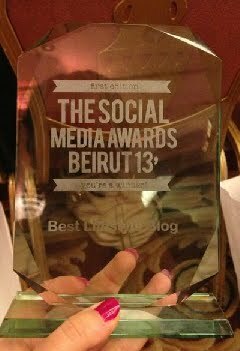 At Basta Bridge, we hopped onto a bus heading back to Hamra. It was some ride! The bus was nearly empty, and our driver, Ahmad, was in good spirits. Chatting away on his mobile, he was resting his right leg and driving with the left -- quite well I must admit. Ahmad kept us entertained and took the long route, passing by Sanayeh Garden, in full bloom, to drop us off nearly at home off Hamra Street. There are many more photos of the walk down memory lane here.